Coprine: Alcohol Poisoning From Mushrooms? Is it possible to have a poison that’s not a poison unless there is another poison around? Ya sure, ya betcha. Enter Coprinopsis atramentaria, otherwise known as the ink, or inky, cap mushroom. 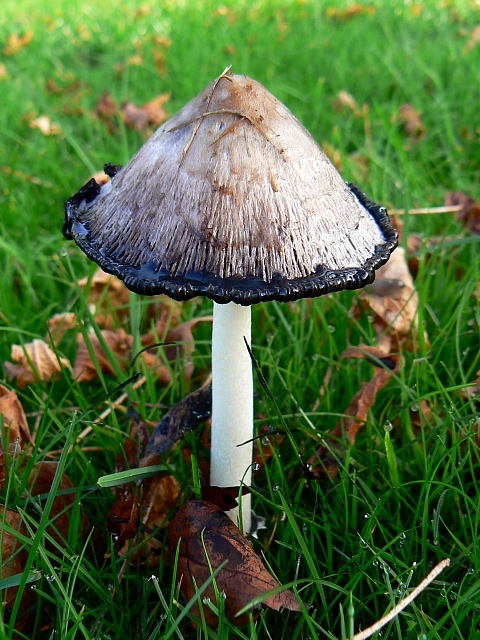 The ink cap mushroom is found primarily in the northern hemisphere, and grows in fields during the spring and fall. It gets its name, ink cap, because shortly after it appears the gills start to decompose into a black ink-like goo. In fact, kids, or kids at heart, can make their own ink from these mushrooms, as described by London’s Natural History Museum. 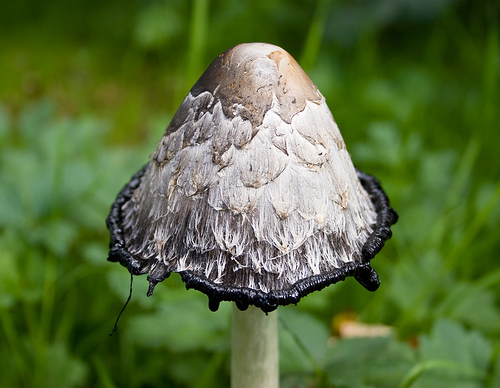 The name ink cap, though, is kind of a “catch-all” term for mushrooms that develop the black ooze, but nearly all of them belong to the genus Coprinopsis. I counted around thirty differ species from this genus that are called ink caps, but I’m sure there are more. But the one I want to focus on is the Coprinopsis atramentarius ink cap (the old genus Coprinus, is still used today, so you may see both scientific names in the literature). Before we dive into the ink cap, I want to make you aware that there are a lot of poisonous mushrooms. There are around thirty that can lead to death, and another fifty or more that will leave you in bad shape. I’ve spoken with mycologists (cool, but uber-geeky mushroom scientists) before, and they’ve shown me side-by-side examples of an edible mushroom and a poisonous look-alike, and I swear they were showing me the same thing. I can’t tell the difference. So before you go full-Andre and start urban foraging*, please get some education by experts first. Emergency room doctors around the world will thank you. * This is a reference to the too funny show “The League”, not guys named Andre. You should watch it. The show, not Andre. I’ve known someone that foraged for mushrooms before. We went to grad school together, where she was a year or two ahead of me, and we later post-doc’d in the same group. She grew up in Russia and was taught by her grandmother how to identify safe mushrooms – in Russia. I wondered how well that knowledge transferred to Southern California where we post-doc’d, and she told me “I’m Russian, a mushroom can’t hurt me.” She also thought that Russian’s couldn’t get drunk off of beer or wine, only vodka. Hmmmm. She’s brilliant, and a superb organic chemist, so I’m not going to argue with her. Back to ink caps. They are edible, and may even be delicious. They are also somewhat non-poisonous. Somewhat poisonous sounds a bit like somewhat pregnant. You either are or you aren’t, right? This is what makes Nature’s poisons so exciting! The ink cap is only poisonous when you consume alcohol. How cool is that? 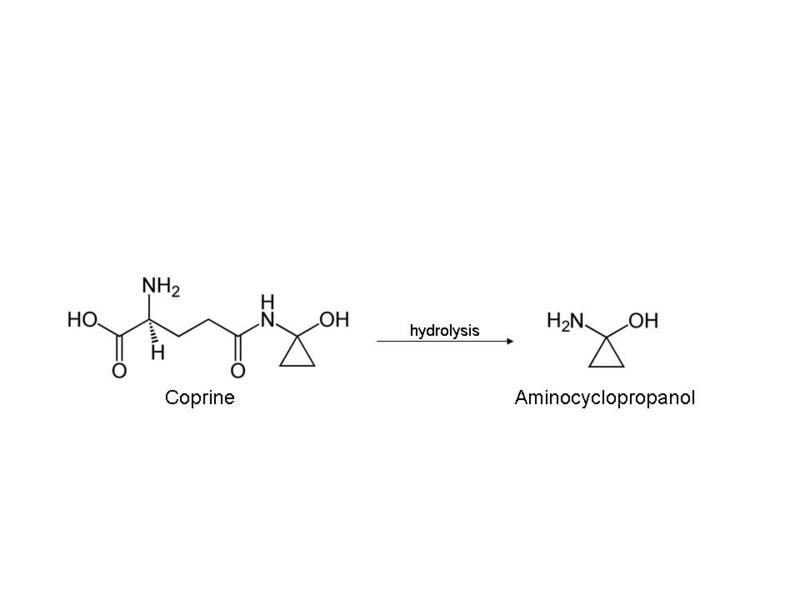 Once formed, 1-aminocyclopropanol (or one of it’s cyclopropanone or cyclopropyliminium intermediates, I’ve seen multiple mechanisms – but if you’re not a geek, don’t worry about it) acts as an inhibitor of the enzyme aldehyde dehydrogenase (1). This enzyme is important in the metabolism and removal of alcohol (ethanol) from your body. Here’s how it works. Alcohol is a wonderful poison that your body wants to get rid of, and is first metabolized by the enzyme alcohol dehydrogenase in the liver. The byproduct of this is acetaldehyde, another poison that your body wants to expell. This is accomplished by aldehyde dehydrogenase, again in the liver, with the end product being acetic acid. Without aldehyde dehydrogenase, acetaldehyde accumulates in the body with disastrous results. Have you ever been out drinking with a group of asians? Ever seen some of their faces become blotchy and flushed? This is because 30-50% of asians have a genetic mutation of ALDH2, the gene encoding aldehyde dehydrogenase, leading to an accumulation of acetaldehyde and the so-called “Asian flush syndrome.” People of European and African decent rarely have this mutation. Now we’re getting into genetics! People afflicted by these mutations tend to have decreased incidences of alcoholism (2). The mechanism behind this is more than likely negative reinforcement. When people with two mutant copies of ALDH2 consume more than a few drinks, faces become flushed, they become nauseous, and experience tachycardia (fast heart rate). It’s hard to become dependent upon something that makes you sick before you experience the good parts. Maybe you’ve heard of drugs that help people stop drinking, like Antabuse. Antabuse (disulfiram) works by inhibiting aldehyde dehydrogenase, and like coprine, makes the consumption of alcohol an unpleasant experience. Coprine is just a natural version, albeit with a few caveats. Coprine though has also been associated with an extreme case of cardiac arrhythmia (5). A 37-year old man ate wild mushrooms (guess which ones) and then consumed three pints of beer. He became flushed and swollen, vomitted six times, and made his way to the hospital. He had an irregular pulse and tachycardia of 120 beats/minute, peaking at 150 beats/minute. The tachycardia subsided 72 hours later. His wife, who did not consume any alcohol because her husband refused to share, was fine. So could C. atramentarius and coprine be used as a natural drug to combat alcohol dependence? Yes and no. On the positive side, effects last about three days, with physical symptoms of poisoning kicking in with as little at 5 mg/dL of ethanol, or about 3 oz. of beer. There have also been no recorded fatalities due to C. atramentarius poisoning. So it seems to be long lasting, effective, sensitive, and relatively safe. But early studies in rats and dogs showed that coprine, and related benzcoprine, decreased testicular weight and depressed bone marrow (6). These were chronic dose studies over a period of 28 and 60 days. Seeing though how the effects of coprine lasts around three days, I would be curious to see the effects of sub-chronic dosing. Coprine has been found in several other mushroom species besides C. atramentarius, but this ink cap gets all of the attention. The take home message is simple: don’t eat wild mushrooms unless you are properly trained, and if you’re me, close to an emergency department. And I’ll throw another one in there: don’t drink and mushroom. For a mushroom primer and myths, see the introduction to Mushroom Week. 1. Wiseman, Jeffrey S., and Robert H. Abeles. “Mechanism of Inhibition of Aldehyde Dehydrogenase by Cyclopropanone Hydrate and the Mushroom Toxin Coprine.”Biochemistry 18.3 (1979): 427-35. 2. Edenberg, Howard J., and Tatiana Foroud. “Genetics and Alcoholism.” Nature Reviews Gastroenterology & Hepatology 10.8 (2013): 487-94. 3. Michelot, D. “Poisoning by Coprinus atramentarius.” Natural toxins 1 (1992): 73-80. 4. Reynolds, W. A., and F. H. Lowe. “Mushrooms and a Toxic Reaction to Alcohol.” New England Journal of Medicine 272.12 (1965): 630-31. 5. Caley, M. J., and R. A. Clark. “Cardiac Arrhythmia after Mushroom Ingestion.” BMJ 2.6103 (1977): 1633. 6. Jönsson, Monica, Nils Gunnar Lindquist, Leif Plöen, Sven Ekvärn, and Tony Kronevi. “Testicular Lesions of Coprine and Benzcoprine.” Toxicology 12.2 (1979): 89-100. Tags: coprine, Coprinopsis atramentaria, Coprinus atramentarius, fungi, ink cap, mushroom. Bookmark the permalink. That was exceptionally thorough. I extend to you a hypha high five. May the spirit of the dikaryon be with you. That’s funny, someone knows their fungi. Thanks for reading! Also known as “Tipplers Bane”, as I found out when my then 3 yo daughter decided to eat some. I didn’t know about that one! But it makes complete sense…the bane of tipplers. Old fashioned, but logical. I have these growing wild in huge bunches in my yard. I knew they were Ink Caps but I did not realize how sick they can make you if you drink alcohol a few days before or after. I am glad I looked them up. The only two photos you use, are both Coprinus comatus, one of the many species that do not contain coprine/benzocoprine. 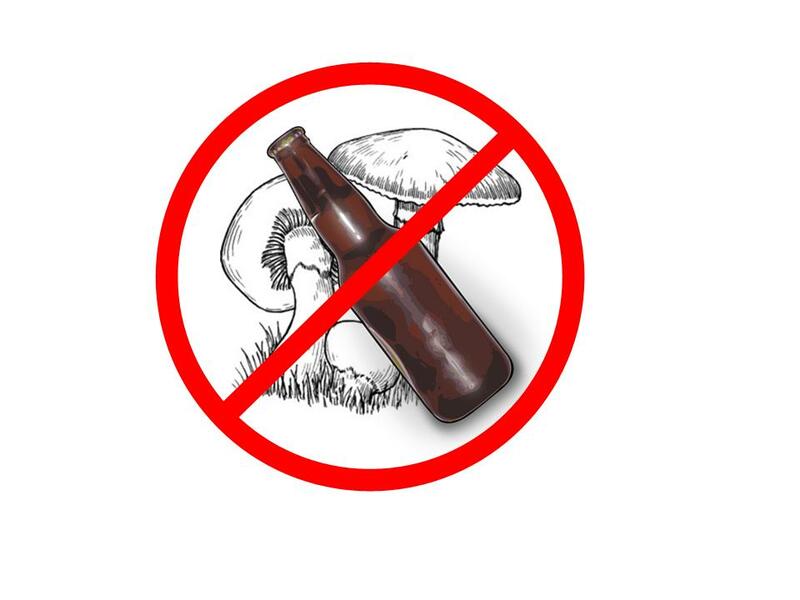 Please change them to Coprinopsis atramentaria or one of the other 12 members of subsection Atramentarii, otherwise people will continue to perpetuate the association of the non-related genus Coprinus to alcohol-related poisoning. I read this old articles of yours only today — simply fantastic! I remember well learning about Antabuse and its mechanism of action during my early medical school curriculum in the ’70s. I remember also reading more about the ALDH2 mutant gene issue in the ’90s after seeing a Chinese immigrant who told me he could not resist the delightful olfactory and taste experience of two glasses of Chianti wine. But no one ever told me a word about Antabuse-like ink mushrooms. Many thanks, really.